Chia̍h-pá—bē? Have You Eaten Yet? A New T-shirt Design… by Us! Posted on Friday, October 1st, 2010 at 2:00 pm. Yep! That’s right! After more than a year, we’re pleased to launch our newest T-shirt design featuring a “ricebowl & chopsticks” concept and highlighting some good ol’ fashioned Taiwanese hospitality! 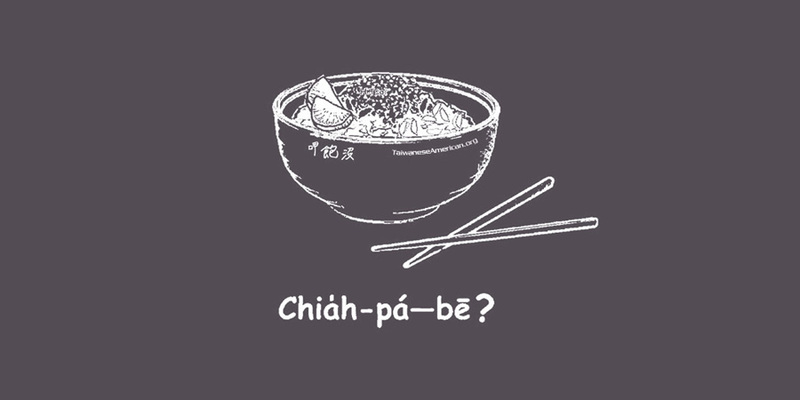 Whether you speak Taiwanese or not, if you wander the streets of Taiwan, you’re bound to hear folks greet each other with this common phrase, “chia̍h-pá—bē?” which literally means, “have you eaten yet?” For those unfamiliar, it’s phonetically written using the Pe̍h-ōe-jī (POJ) system, which also has a unique history of its own. Pick up one of our shirts from our Online Store, and while you’re there, check out the fantastic new photos of beautiful folks sporting our Taiwanese pride designs! Click here or on the Store tab above! Remember, all funds raised from our T-shirt and product sales are considered donations, and we in turn donate 100% of it to other awesome projects, events, and organizations in the Taiwanese American community! That is definitely nice looking shirt… ill be getting one! Good design on implementing Taiwanese in there. NB: my Taiwanese is rusty. But — “have you eaten yet” isn’t the literal translation, merely implied. The actual translation would be: “are you full from eating”, yes? Can someone authoritative comment, please? @SinoSoul You’re actually correct. But “have you eaten yet?” just sounds more familiar, especially among our non-Taiwanese Asian American friends! But, bonus points for you! I certainly don’t speak Taiwanese (Mandarin is difficult enough for me to get through) but this phrase was explained to me when I first got here…one of the only things I hear. I suppose just because I recognize it.